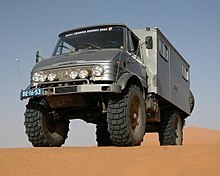 Off-road transport is moving people or articles on land without the use of paved roads, typically using off-road vehicles. Off-road racing is a format of racing where various classes of specially modified vehicles (including cars, trucks, motorcycles, and buggies) compete in races through off-road environments. An off-road vehicle is considered to be any type of vehicle which is capable of driving on and off paved or gravel surface. [not in citation given] It is generally characterized by having large tires with deep, open treads, a flexible suspension, or even caterpillar tracks. Other vehicles that do not travel public streets or highways are generally termed off-highway vehicles, including tractors, forklifts, cranes, backhoes, bulldozers, and golf carts. Off-road vehicles have an enthusiastic following because of their many uses and versatility. The use of higher clearance and higher traction vehicles enables access on trails and forest roads that have rough and low traction surfaces. This page was last edited on 28 October 2018, at 16:52 (UTC).